On December 8, 2004, several Filipino American community leaders in Southern California voted unanimously to form the Jose P. Rizal Monument Movement (JPRMM) to carry on the noble and patriotic objective of erecting a Rizal Monument in California. Twenty-six Fil-Am leaders from different associations elected an altruistic servant leader who made the Rizal Monument project as the central theme and mission during his chairmanship of the Kalayaan 2004 Philippine Independence Day celebration in Los Angeles. He was given the blanket authority to appoint members that will help and ensure the accomplishment of such a tremendous task ahead. Shortly thereafter, on December 20, 2004, the Jose P. Rizal Monument Movement was incorporated as a non-profit public benefit charitable organization in California – Corporation #2693669 under Code Section 23701D. Subsequently it was also approved as a public charity exempt organization under Section 501(c)3 of the Internal Revenue Service Code with EIN 20-2522720. The story of the movement spanned more than a decade and had the support of former Los Angeles Consuls General Edwin Bael, Marciano Paynor Jr., Willie C. Gaa, Mary Jo Bernardo-Aragon, and Maria Hellen Barber De La Vega, along with the strong financial support of Kalayaan 2001, 2004, 2005, 2010, 2011, 2012, 2013 and several major Filipino American associations/organizations. The movement to erect the Rizal Monument became a common denominator for the Filipino American community, a unifying force and a galvanizing factor for all supporters. On November 5, 2011, several Fil-Am association leaders, the Philippine Consulate General, the City of Carson and JPRMM Founder Mon’Chito’ G. Mandap’s dream and burning passion of a larger-than-life bronze statue Dr. Jose P. Rizal Monument, came to fruition when the Groundbreaking Ceremony was held across from the Congresswoman Juanita Millender-McDonald Community Center (Carson Civic Center). The Dr. Jose P. Rizal Monument has a total height of 15 feet: 8-foot bronze statue on a atop a 7-foot granite pedestal. It was crafted by renowned Filipino sculptor Toym de Leon Imao, who was 2004 Ten Outstanding Young Men awardees. 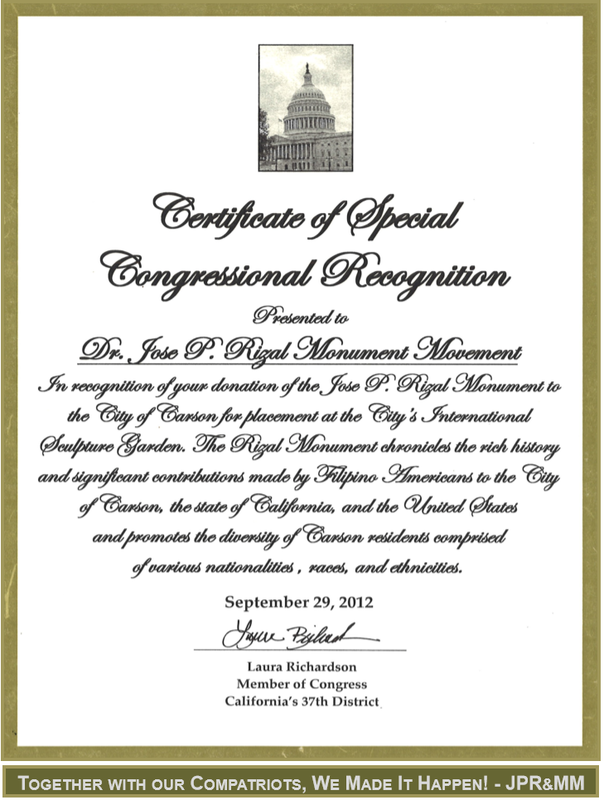 The Monument is the only full-sized or larger than life statue of Dr. Jose P. Rizal in California. Its installation was made possible through the combined vision, efforts and resources of the Jose P. Rizal Monument Movement, the Alliance of various Filipino American Associations, in partnership with the Philippine Consulate General in Los Angeles and the National Historical Commission of the Philippines. The 15-foot Rizal Monument so far is the first donation standing tall as an imposing structure in the International Sculpture Garden that was created by the City of Carson, California as the home of many sculptures symbolizing heroes who contributed to the spread of democracy and freedom around the world. The primary objective of the Jose P. Rizal Monument Movement (JPRMM) in building this monument is to foster a sense of patriotism and spirit of unity among us Filipino ancestry living here in the United States of America, which is a country of diverse nationality, race and culture. It is hoped, that united and helping one another we may be able to attain upward mobility of station in life in our respective communities that would give us a better life and respectability as a people. Moreover, united we may be able to empower ourselves – politically, culturally, educationally and economically. And empowered, we will surely obtain greater leverage with the policy or decision makers in the cities we respectively live, the state or even the national or federal government for whatever concerns or issues that would further improve our lives. Indeed our spirits and sense of pride were lifted with the installation of the magnificent Rizal Monument in City of Carson, Los Angeles County, So. California. We have done a good work for our Filipino race in doing honor to the memory of the greatest Filipino national hero in putting up this Rizal Monument in this part of the world. For, in effect we have also done honor to ourselves and those who will come after us because we have attached ourselves to his name and fame imperishable and immortal. Whenever there is any attempt to deride us because of our race, we may calmly point to the monument we have built to the memory of Dr. Jose P. Rizal. After our earnest representation and the presence of Consul General Ma. 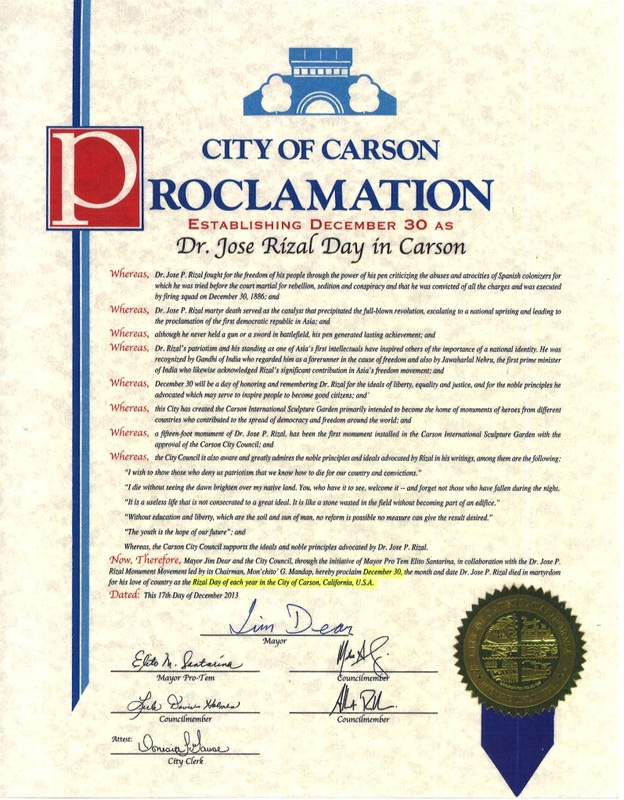 Hellen Barber De La Vega leading the Fil-Am community on December 17, 2013 and with the strong support of Mayor Jim Dear and Mayor Pro-Tem Lito Santarina, the City Council of Carson unanimously passed/approved a resolution proclaiming December 30 as the Rizal Day of each year in the City of Carson, California, U.S.A. This is a historic event because we believe the City of Carson, CA is the first city outside the Philippines to do such. This resolution is a crowning complement to the Rizal Monument that will add honor and luster to his fame. Moreover, it will necessarily go by the people of Filipino decent to gather at the Rizal Monument to commemorate his heroic martyrdom with wreath laying and holding programs that befit the occasion. The occasion will also provide the opportunity to renew friendship and camaraderie, to discuss each other’s progress and benefit from each other’s knowledge and experience. Through the years, the Rizal Monument will be a source of pride and a landmark that will symbolize our Filipino heritage and culture. It has established and demonstrated our unity, care, service above self and love of country. It will serve as the driving spirit that will remind and encourage us to do more cooperatively in harmony. It will not only memorialize the life and sacrifices of our national hero but also perpetuate those who altruistically made it happen and pass it on as our legacy to the future generation.